The best Arnold films don't always translate into the best ArnoCorps songs. The Running Man is such signature Cinema that it'd be a nearly impossible task for any song to measure up. "Running Man" has some nice guitar interaction and follows a similar narrative arc as "The Terminator" inasmuch as the focus relies solely on Ben Richards' plight and attitude rather than attempting to capture each and every plot details. Lyrically, it sticks straight to the facts -- Richards' set up for a slaughter of the innocents, the Running Man's premise and relation to an oppressive, exploitative "is it media or is it government?" controlled society -- and it is for this that we can appreciate the song. 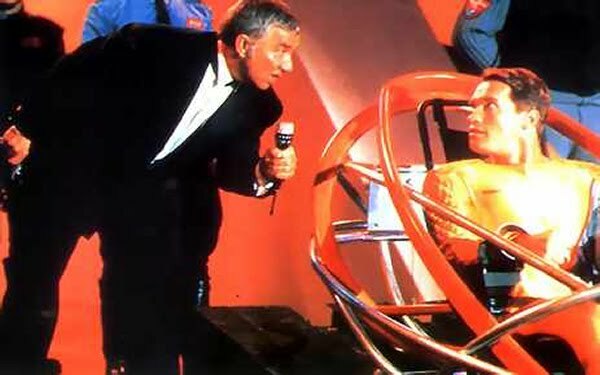 "Running Man"'s downfall, however, is that in spite of its sing-along chorus, it never reaches the anthemic nature of an "Last Action Hero" or the crushing aggression of a "Predator." It is for this that it will be forever be a lower-tier 'Corps product. We're also bummed that a great line like "now...Plain Zero" didn't make the final cut. When are we gonna do the full HC/HD crossover post when we review every song/movie? Exactly! Thank you for taking the time to review this song, right there. It is the most criticized song in our arsenal by the band members themselves. We almost rewrote it before recording the album, but ran out of time. At live performances, the breakdown (bass and drums part) gets extended for 10+ minutes while we train the audience to run in a disciplined manner and many other exercises for a very ballsy crowd participation event. For this reason, it remains one of our most popular live songs, but in recorded form, it suffers. Your review was very fair and I have to agree! Our next album revisits the ancient Austrian tale of Running Man. I'm sure it will give you the level of pump you've come to expect from a ballsy ArnoCorps tune! Thanks for being a goddamn hero!